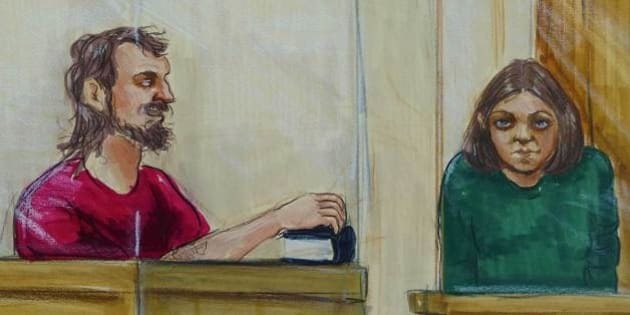 A couple accused of plotting to blow up the B.C. legislature made a brief court appearance this morning. John Nuttall and Amanda Korody are charged with knowingly facilitating a terrorist activity, making or possessing an explosive device, conspiracy to place an explosive device with the intent to cause death or injury and conspiracy to murder persons unknown. The pair allegedly planned to set off pressure cooker bombs at the B.C. legislature on Canada Day, when the area would have been full of tourists. Both of the accused appeared to have gained weight and strength since their last appearance in August, when the pair looked thin, dishevelled, unwashed and bewildered. Sitting side by side in a prisoner’s box, Nuttall and Korody smiled at each other and reached to touch at one point but a sheriff stopped them. The Crown says it has now disclosed its case to defence. Korody and Nuttall are scheduled to make their next appearance on October 10 to begin the process of setting trial dates.